This is probably an abstract question to ask on a musician website and I'm sorry for the inconvenience, but how important is music theory to a dancer? I'm trying to learn as much as possible to help me in my dance career and I read somewhere that musical theory is important. I try to dance as many styles as possible to expand my knowledge so I'm ready to look deeper in to music as well, but I'd like to ask a professional (you) if I'm wasting my time with musical theory and should focus purely on dancing or if it'll actually help. Thank you so much for your time! :) I think it's great that you use this to help musicians out there! This is a very interesting question, and the answer is... I'm not really sure, but I will give you my thoughts! I'm sure one advantage of having a deeper understanding of theory would be in terms of the timing of your steps. It would also make it easier to converse with a live musician who was accompanying your dancing. Knowledge of how notes relate to each other may also be helpful. On another level an understanding of theory can lead to a better understanding of the music itself and of course, this can lead to better, more complete interpretations of the music when dancing. I believe a knowledge of theory gives a greater insight into what the composer wished to express through the music. I would imagine that the most important aspects of theory would be rhythm and melody to you as a dancer. The other parts such as intervals, keys etc. may not be so useful. 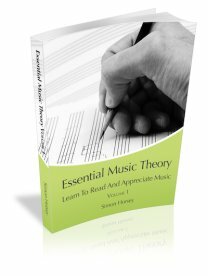 As far as learning just theory goes, it can be hard to learn theory without playing an instrument. I suggest, if you are looking to learn, that you also have a keyboard handy, or at least a keyboard app on an iPad or similar, as this will help you visualise and hear what you are learning. There is actually a DVD and a book available on Amazon which you may be interested in. Good luck with your dancing... and with your theory if you decide to pursue it!